If you have spent anytime studying media at university or college then the topic of copyright and the law is bound to crop up. Copyright laws were set down in order to prevent others from exploiting original material without paying the creator of the material. Copyright issues have been the focus of much media attention recently due to the many cases of copyright theft via the internet. Once material such as books, works of art or music have been created they are automatically protected by copyright. In the UK no formal registration of copyright is needed, although it would be wise to put written copyright protection in place. Copyright laws exist in order to protect the creator of the work. It allows the creator to have control over his or her creative works including permitting or prohibiting the use of their works in other areas. Original dramatic, musical, and artistic works, literary works and computer programs. Films, television and cable broadcasts, and sound recordings. Typographical arrangements of published editions of works such as magazines. The creator of the original works can only claim copyright if the work is a result of independent effort. Even if two films were to appear that are almost identical, copyright cannot be claimed if the work was produced independently by each film maker. And although people have tried to claim copyright, you cannot claim copyright simply for having an idea. Copyright and the law also sets out direct lengths of time that copyright will exist. For literary works, music, dramatic works and works of art the copyright will last for 70 years from the end of the year that the owner of the work died. For sound recordings or broadcasts the copyright will last for 50 years from when the owner died. For films the copyright will also be 70 years from when the director of the film died or from when the work was last made available to the public. Unlike many other countries there is no formal copyright procedure needed in the UK. Copyright is automatic once the work has been created as long as it qualifies for copyright protection. There are of course extra precautions that can be taken by the creator to ensure against infringement of copyright and these can include marking © on the work followed with the name of the creator and the date. Infringement will come about if another person uses original material without permission or payment to the creator of the work. If for example a third party were to take excerpts from a book without the author’s permission and then publish the excerpts in a magazine then this would be infringement of copyright. There are some exceptions to infringement of copyright and these can include material that is used for educational purposes and used in libraries and public archives, and it can also include works placed permanently in public places. If work is used, for example an excerpt from a book, it may be a minor infringement but it will depend on whether the work has been previously published or the amount of material used. The ease of copying and distributing material via the internet has been a subject of much media debate and a few court cases. Copyright and the laws contained within the Copyright, Designs and Patents Act of 1988 does extend to the use of material over the internet such as films, music and literary works. Many people have found themselves facing heavy fines for copying and distributing music and films over the internet without permission from the owner. Similarly this copyright does extend to computer programs and computer software. There are many cases of people copying computer operating programs onto discs and selling them illegally. They are illegal because they are breaking the copyright act. In cases such as these, copyright and the law will apply not only to those selling illegal copies but also to those buying and using the illegal copies. I am thinking of setting up my own charm/soaps stall. however I wanted to do sell some fan art such as charms based on popular cartoons and movies. 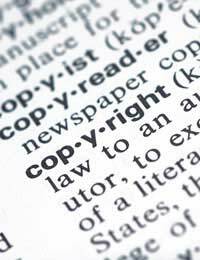 how can I work around the copyright legally?